Built in about 1996, this model represents the all-conquering car of 1972 which benefitted from the kind of synergy that makes everything come good: Emerson Fittipaldi had sufficiently matured as a driver having won once at Watkins Glen in 1970 and worked through the less easy times in 1971. Firestone had brought out lower profile tyres that now worked and Lotus had adapted the 72’s suspension and weight distribution to derive the best from these new slicks whilst Emerson developed his communication skills and natural talent at testing a car. Come the beginning of the 1972 season, everything was in place and with a new colour scheme of black and gold (in John Player Special), the car looked great and went fantastically. Lotus was well used to development of the car throughout the season and worked hard to build on every experience; and so there was a succession of changes especially to the rear of the car in relation to weight distribution centred on the design and deployment of the oil tank and rear wing. These were progressively developed to optimise rear traction and downforce bringing the best out of the tyres, Firestone in turn developing the tyres to suit the Lotus. Emerson keen to win, exploited his own natural strategic approach combined with mechanical sensitivity to maximize his points haul during the year and be crowned Drivers’ World Champion at Monza, in September. In so doing, he became the youngest World Champion and won five times, coming second a further two times, failing to score only twice before Monza, due to mechanical failure. 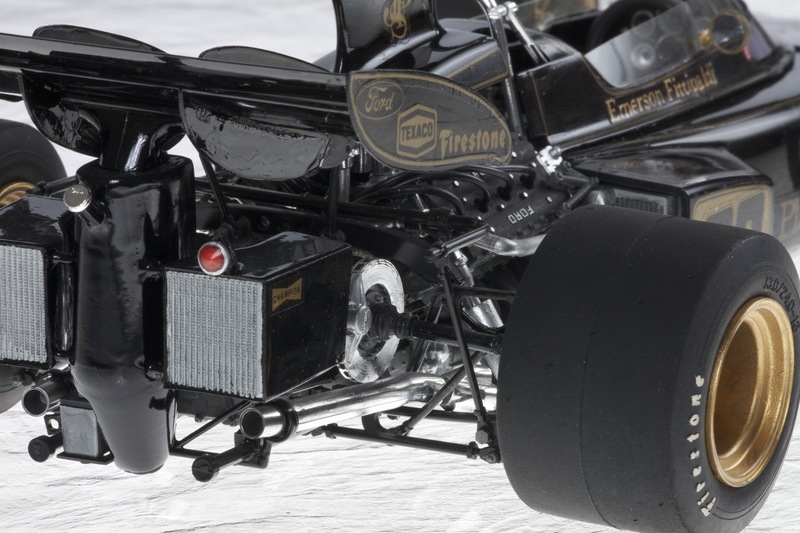 The 1972 Lotus 72D going into 1973 represents the zenith of the design and is the personal favourite of many F1 followers. Emerson’s singlehanded efforts (Dave Walker in the second car scored no points) brought Lotus the Constructors’ title ahead of Tyrrell whose Jackie Stewart (Tyrrells 003 and 005) was unable to drive to his full potential, due to ill-health mid season. 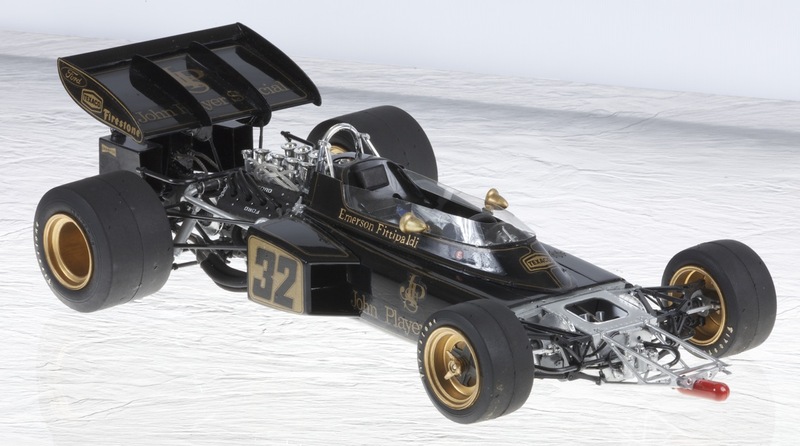 For viewers used to Tamiya’s Lotus 72D model, an understandable disappointment and perplexed state of mind is to be expected. The remedy is to inform such knowledgeable folk, that this is a conversion to the car driven earlier in the 1972 season at Nivelles, in Belgium, where Emerson scored his second of five wins that year. My original 72D in the style of Monza 1972 (built in 1981) was converted to this earlier car in order to capture the evolution of the car along with variation in windscreen depth, livery and most obviously rear oil tank and cooler arrangement, with a more forward and higher rear wing. If I am honest and should I re-make this model, various things would be changed. The windscreen would be improved upon and the rear wing set lower, for it does look a little too high to me. Having measured the model’s rear wing height, this appears to be 12cm (scaled up from 1/12) higher than the post 1969 Monaco Grand Prix regulations stated it should be, ie that the rear wing should be no higher than 80cm from the lowest surface of the entirely sprung parts of the car. I had no access to such a car of course (if even it existed in this form) and barely no photographs. Looking at it again, the pivot point under the rear wing and height of the oil tank may have to be reduced on a rebuild to bring this into line and improve the look of the model. The rear wing of the later 72D was used with revised fences and completely scratch-built rear oil tank and coolers, the original position for the regulation rear bad-weather light also being utilised, which was on the right rear oil cooler shroud. Altered position of decals on the car’s flanks made for a different feel, especially as the cut-down cockpit surround with a deeper screen didn’t yet allow room for the John Player Special brand name. The early season livery allowed for a larger declaration of the driver’s name along the cockpit sides and this was no doubt taken for granted, until later squeezed out by the need to occupy this more valuable sponsor space, with the brand name. I had no option but to hand-paint Emerson’s name and the overall effect is satisfactory, but perhaps in future, I may be able to keep in contact with an Oki printer owner, in which case, my efforts could be re-addressed. The cockpit surround as supplied by Tamiya is deficient in various ways, for it doesn’t have quite the right shape. This tends towards being narrow and on studying the originals, they were made in clear colourless perspex and painted on the inside to varying levels to give varying depth to the windscreen itself, deeper earlier in the season than later on. The model was well built otherwise, with added details relating to the cooling system and engine, seat belts etc. 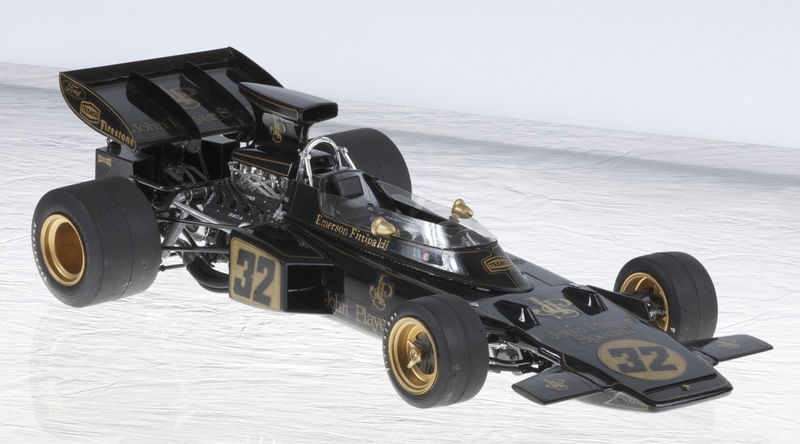 Naturally, if I was rebuilding the model now, I would like to employ my ‘discard and replace’ policy in many areas and superdetail the engine, improve the rear oil tank/cooler/rear wing arrangement, supply an uprated gearbox and what I would give to obtain a set of Studio 27 decals for the Lotus 72D…any thoughts? So having read this, I hope you are not so disappointed, as there is hope and I know many folk have built beautiful examples of the late season car, especially if they had access to the Studio 27 decals, Mike E to name but one (see Mike’s Lotus 72D amongst others in the Telford Modelsport 2008 show report, which is can be seen under Miscellaneous, within the Published Works listings on this website). There has also been at least one very good model conversion to the 1973 car, incorporating the deformable bodywork regulations. I’m about to rebuild my Tamiya Lotus 72. It was dropped and has been stored for many years and I’m only now getting round to doing something about it. Fortunately all the parts have survived but the front tyres have become very deformed, brittle and have cracked so can be classed as a complete write-off. Does anyone know where I can get another set? Hi Tom, what a beautiful model, I do hope you find some front tyres. If no one on eBay advertises, possibly HiroBoy website in UK may be able to have replacements, but it a long shoot as they do supply generic Goodyears and you might otherwise achieve better result via eBay re a not so well built 72D and retrieve the tyres and other parts for spares etc.http://www.fawcettmodelsandpatterns.co.uk/racing-car might be able to help, worth contacting Brian personally.